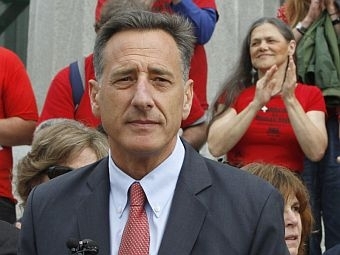 Governor Peter Shumlin spent much of this winter focused on his plan to overhaul the state’s health care system, but now he turns his attention to a number of energy issues. Vermont’s largest utility, Central Vermont Public Service Corporation, is seeking regulatory approval of its takeover by a Canadian firm, and the state Public Service Board has approved the controversial Lowell Mountain wind energy project. We discuss the outlook for the development of more renewable energy projects across the state, and we check in on disaster relief for flooded areas of the state, when Governor Peter Shumlin is our guest on Vermont Edition. Officials at Vermont Technical College say a school competition and a grant from IBM helped reduce the school’s electric bill by more than $40,000 in one year. Both energy developers and the citizens who oppose their projects complain that the state’s regulatory process is too burdensome. But both sides fundamentally disagree about what’s wrong, and how to fix it.